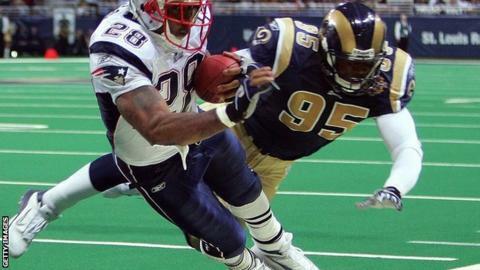 NFL at Wembley: Can St Louis blunt New England's offence? The New England Patriots take on the St Louis Rams at Wembley on Sunday in the sixth International Series match to be played in London. The Rams, nominally the "home" team, have exceeded expectations so far this season, bouncing back from last year's disastrous campaign during which they only won two of their 16 games. St Louis have recorded three victories and four defeats so far in 2012 but will be underdogs against the Patriots, who made the Super Bowl in February. The Rams know that New England's weak point this season has been their secondary, particularly against the deep pass. The Patriots' pass-rush hasn't been particularly strong, and the Rams' offensive line needs to keep it that way. That will give quarterback Sam Bradford and his receivers enough time to put pressure on the Patriots' safeties downfield. One way to open up passing lanes would be to run the ball effectively, and lure the Pats into playing more defenders close to the line of scrimmage: running back Steven Jackson, as ever, remains a key for the Rams. Tipped to be as successful again this campaign, New England have so far struggled to find any consistency. Key to the outcome will be whether St Louis's much-improved defence can contain a potent New England offence led by star quarterback Tom Brady. Bookmakers in Las Vegas typically make the Patriots, who have won four of their seven games, favourites to win by seven points. The teams have prepared for their Transatlantic trip in very different fashion. While the Rams have embraced their unfamiliar surroundings all week, the Patriots decided to do the bulk of their work back home before flying in for the game on Friday - the same routine they follow for all of their away trips. It was initially thought St Louis would really get to know Britain. Back in January, owner Stanley Kroenke (who is also Arsenal's majority shareholder) agreed to switch one of the Rams' eight regular season home games to London for each of the following three years before the Jacksonville Jaguars took over that arrangement. Having staged competitive matches at Wembley since 2007, largely featuring different teams, the NFL wanted to discover whether British fans would prefer to see the same team returning each year. Were that to be successful, a franchise permanently based in London would move a step closer. Next season there will be two Wembley games. The Jaguars will take on the San Francisco 49ers in October 2013, a month after the Minnesota Vikings meet the Pittsburgh Steelers. While their own London trip may be a one-off, the Rams have certainly taken advantage of Kroenke's dual interests, basing themselves at Arsenal's Colney training headquarters. "We are very fortunate that we get to train here," coach Jeff Fisher said as several of his players admired the facilities. Fisher, who has visited London twice before for pre-season games, with the Philadelphia Eagles in 1989 and the 49ers three years later, said he was not overly concerned by the fact that many of the fans at Wembley will be more excited about watching Patriots star Brady. "We had a lot of Green Bay Packers fans in our stadium last weekend and that didn't bother us a bit," he said, even though they lost 30-20. "It didn't have an impact on the outcome of the game." The Rams' defence has been one of the biggest surprises in the NFL this season. Before losing to the Packers, the Rams had limited opponents to an average of 14.7 points per game at home in the Edward Jones Dome in victories over the Washington Redskins, Seattle Seahawks and Arizona Cardinals. Despite being inexperienced, they have the 10th-ranked best defence in the league - a big improvement from last year when they were 22nd out of 32. How should the Pats play it? The Pats haven't been able to generate too many big plays passing. Former Ram Brandon Lloyd hasn't provided the deep threat their offence lacks, and tight ends Rob Gronkowksi and Aaron Hernandez appear to be playing at less than 100% due to injuries. Watch to see how the Pats pick on the Rams' linebackers. Though James Laurinaitis is mobile in the middle, New England will use Wes Welker and the tight ends inside. But the worry will be if the Rams keep it close, the Pats will fail to close out the game in the fourth quarter: they've run the ball well at times, but not when they need to chew up clock, and the short passing game can't do that because every pass you miss under pressure stops the clock. Patriots counterpart Bill Belichick has been impressed with the Rams' turnaround after their poor display last season. "Coach Jeff Fisher, as usual, has done a great coaching job there," Belichick said. "It looks like they're very sound. They do things well fundamentally and you really have to do a good job against them. He's moulded it into a real competitive football team in a hurry." Fisher was quick to point out the scale of the challenge his defence will face against the NFL's best attacking line-up. "They're playing as a group probably as good as they've ever played, in my opinion," he said. "With the weapons that [Brady] has now, it puts a lot of pressure on the defence. We're going to have to slow that pace down a little bit." For the Rams to upset the odds, defensive stars need to put in a fantastic performance. They include linebacker James Laurinaitis, son of former professional wrestler Joe "Road Warrior Animal" Laurinaitis who wrestled at Wembley during his career. Laurinaitis Jr remembers growing up watching the video of his dad in action there. "To be able to be in that stadium, and with the Olympics just being here and everything, it's going to be pretty cool," he said.